ok so I got Korres stuff for the christmas and one of the thing I bought the second time around is lip butters ;) I got them in guava and jasmine. Korres is Greece's oldest homeopathic pharmacy makes wide range of beauty products which most are made of all natural ingredients. A buttery lip balm that melts on the lip and offers a shiny,tinted finish. The combination of the shea butter and the rice wax offers deep hydration and the softness, ideal for chapped lips. The smell of the lip butter does not smell like the lotions but have really sweet scent, there is no flavor to the lip balms either. The tinted color is very minimal so you will see slight change in the color when you applied on the lips and it goes on shiny, I love this jasmine lip butter it is tinted enough to make your lips slightly pink rather than having red undertone, it neutralizes my lip shade. Hope this review helps is you were interested in korres products! I love the pretty natural color this gives off. The Barbie violet lens looks so nice on you! Ooh so pretty! I like how natural it looks, and how it just enhances your normal lip color. Ooh, the Jasmine lip butter actually looks really pretty on your lips! I tried it a couple times when I got it in my Sephora F&F haul but I wasn't too impressed with it then since it wasn't quite as moisturizing as I needed it to be. Maybe I should give it another chance though haha. I need a nice pink gloss, I'm not to keen on any with red undertones too! Hmmm.... I have the jasmine lip butter and it doesn't look as pretty on me! Maybe I'm not wearing it too thinly... :? Wow that does sound like a really nice lip gloss I need to check it oout!! Eki you look so pretty!! Look like a doll in that pic =).. That jasmine lip butter looks really good on you!! i can care less about the lip butter when you look so pretty!! but lol the lip butter is something that i have my eyes on. thanks for the review. That's such a pretty color! Love it! the lip balm sounds nice, I love stuff from Korres too! You look amazing in that photo! That lip balm looks amazing, thanks for sharing and your lips are glowing, he he! OMG I sooooooo want it now! I am a big fan of lip balms, in fact I use to be a very heavy lippy balm junkie ^.^ I have improved though and minimised my purchases coz I gotta use all of them first! Looking gorgeous as usual Eki! I have the Jasmine korres and Guava too! Jasmine is my favorite one so far. I love those violet contacts on you, you look gorgeous! it really looks so natural & made your lips look softer! i hate it when a lip products feels sticky. yay for this for not being sticky! you look pretty on this pic,hun! 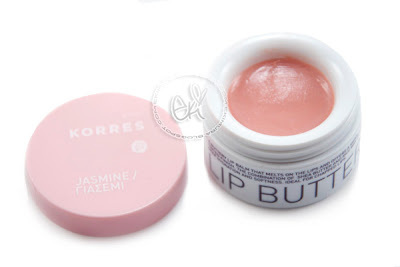 Korres Jasmine Lip Butter is my favorite! It smells so yummy and it is such a pretty color. :) I love the way it looks on you! What font do u type ur blog in? フォントのあなた の フォント わ とても可愛いでしょ！！！( Your font is really cute). Is it from dafont.com or something?